According to the DWTS cast members and two judges (Bruno and Julianne Hough), they believe that the social media world created a 'mountain out of a mole hill' and fabricated a story that was NOT a story. Bruno even takes it further saying "it was a bit evil." 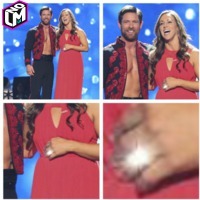 Watch for yourself if you think Erin was supposedly "rolling her eyes" at the marriage proposal of DWTS contestant and Iraqi War Veteran Noah Galloway. Duck Dynasty: Sadie Robertson I’m About To Go Footloose At My School!